I set out to create a simple system for SEO using Ranking Factors for 2018 that you could part automate, part get done for you and minimize the time spent as well as the cost of an effective SEO campaign that will rank competitive keywords and build authority and social proof for your blog, brand or product. Here is what I have come up with and proof of rankings for videos and blog posts on page one of Google, with literally 3 minutes set up SEO campaigns is provided throughout the video tutorial. So What Are The Major Ranking Factors For 2018? Watch the Video tutorial below, as I go through all of the ranking factors listed above and discuss how we can use this system to rank for competitive keywords, local niches, affiliate marketing and Adsense sites. That was quite a lot to take in huh? Well luckily for you I have the webinar slides and all you have to do is optin to get them and you will also receive notifications on future tutorials and discounts on my products. If you are using automation it will work, but you need to be using High Quality Content to minimize the chances of real traffic bouncing off the page and you will also need to take time to create Great Headlines & Descriptions. Important Notes About Your Landing Page Or Blog Post.. The landing page can be a blo​g post article, squeeze page or sales page etc. My example is a blog post in the rankings that I show ​on the video. You do need to max out the Yoast SEO plugin to green and you do need to use relevant internal linking as well as external linking to relevant content. The external links can be dofollow, I haven't noticed anything negative from not doing nofollow as long as it's linking to a quality web page within the topic of your content. You should also sprinkle adwords grouped keywords and this is done by adding your main keyword to the Google keyword planner and when the results show then click on grouped keywords tab and choose the group that is closest to your main keyword. Always create sub-headings too using H3 tags and make sure you have at least one H1 tag and one H2 tag in your content. You can also use related search phrases for ideas from the bottom of the page when doing a google search for your keyword, but only if they make sense to the content that you are creating. Also consider that you can create answer style posts can get snippets for answers and list style posts can get featured​​​​​ snippets. The great thing about this copy formula is that you can switch the ROT around to RTO of any combination that you feel fits in. If you have a keyword tool like Long Tail Pro or Keysearch then always do some quick keyword research to get more ideas to build into the content and phrases that have traffic that you can rank for. Always create YouTube video thumbnail that stands out in the search results as this will help maintain the relevancy CTR clicks and it's a really huge ranking factor for today. Again, create a headline to attract the click on the video title and also in the YouTube video thumbnail. Add just one link in description to the landing page that you want to rank, this can be adjusted later after you have maintained your rankings with real traffic. Always give a reason to click the link in description such as a content upgrade like mind map, PDF, free report or something that is RELATED to your content if possible. Make sure that you use all tags also in the video description and main keyword in all 3 - tags, description & title. I like to create 300 to 500 video sharing site accounts with the bulk account creator in Video Synd Alpha or Traffic Scout Alpha tools and I will reuse these accounts multiple times. These accounts can be created in 3 or 4 clicks as we use our own email servers for account creation and we can create unlimited profiles with my Alpha SEO tools. All you need is to use quality proxies and a captcha service. I suggest to use the use the Long Tail Alpha tab which is in most Alpha tools to create unique headlines. I try to used closest grouped keywords from the adword keyword planner for long tail alpha titles which will be titles used in the 2nd tier link blast and also use the automated thumbnail creator. For the video I like to use Clipman web app or you can use viddictive or videlligence tools to do the same type of video. These are easy to do videos that take 2 or 3 minutes to create using templates and you just add the url of your landing page and it will create a video using some text and images from the url provided and you have choices at every step. One link in description to youtube video. I have ranked competitive keywords with zero backlinks but the rankings will not stick unless we maintain it with some basic and simple principles. Always use high quality links only for you're first tier links to your landing page. We all know that guest post links are good despite Matt Cutts warnings a few years back, the trick is to get links from real authority sites with real traffic. The main problem is that writing guest posts for decent sites is time consuming as it often has to be epic content of very high quality. The first is that our team are doing outreach and we are not asking for guest posting opportunities, instead we are asking to add a link to existing articles as it's fast and easy and not hard to do at all. Of course this costs money but i rather pay a few extra bucks than site and write epic content for someone else’s blog and the RankAttack system is designed to be super simple remember? High quality pbn links can be good if sites look real and they are built on quality spam free domains but i prefer my way to just get a link in an existing article on a real site with traffic and backlinks and some authority. It's job done and move on and we keep the momentum going with our super simple and effective ranking system without breaking a sweat. How many links are needed really depends on the quality of the sites providing them. A high quality press release will increase the number of referring domain links which is another major ranking factor for 2018 and all done with just one piece of content too. So we have reached out to a few people and found someone to write the press release and distribute it for at least 400 links and as shown in the video some of the sites linking in have pretty decent SEO metrics. Again it's job done and keep moving forward even if it does cost some dollars. If using press releases then use the opportunity to embed the YouTube video in the press release too. To help maintain your rankings you can run several views per week with the vid attack alpha scheduler and you should create campaigns for Relevancy CTR clicks using both the video & blog browser. Make sure that you add google analytics to your site and verify it. Always add cta’s with a content upgrade to your content so that you maximise the traffic and can remarket to them. This is ready made and warm future traffic and customers! Always add retargeting to your site even if it's just one site wide pixel and build your retargeting audience in the background. If using 301 redirects I suggest using to link only for category pages within your blog and only with high quality spam free domains. This way you don’t need to spend time with building big PBN networks with lots of sites. We can also do something similar with one page topically thematic sites that are relevant to your blog. With this method you can later redirect the topical mini site to specific blog posts. I like to do this with sites for free tools as this gets traffic when you get ranking for the main keyword. Get The RankAttack LIVE SEO Course Free! 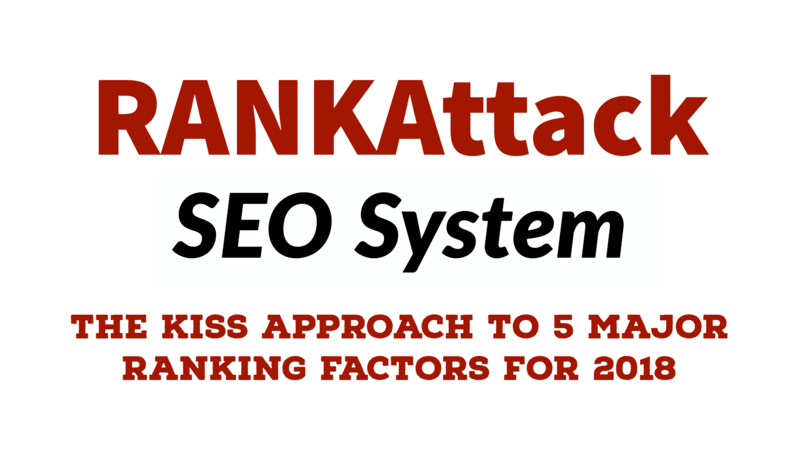 As mentioned on the video we will be launching our RANKAttack SEO system as a service and if you would like to be notified of this service you need to optin to my mailing list using the optin box above in this blog post. If you are one of the early adaptors to this service you will get in at the lowest cost.